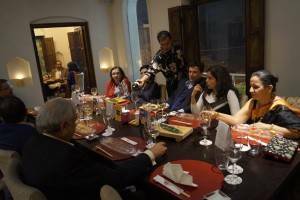 Far West and Far East never got closer than on the night of November 19, 2015 at the terrific dinner organised by The Wine Society of Delhi at En, the Japanese restaurant, lubricated with a selection of marvellous Montes wines from Chile, writes Bunny Suraiya. The evening got off to a rocking start beneath the stars and the benevolent gaze of the Qutub Minar – inexplicably unlit, alas – on the spacious rooftop terrace where members hobnobbed convivially over several glasses of Fratelli sparkling wine accompanied by appetizers of edamame, tempura and superb wasabi shrimps. For dinner we moved downstairs to the main restaurant for a sit down meal, with three kinds of appetisers with assorted sushi rolls (chicken, salmon and tuna as well as an assortment of vegetarian) already on the tables, accompanied by Montes Chardonnay, which was generously topped up while The Wine Society’s ebullient president, Bunty (Kulbir) Singh welcomed all the members and formally introduced Carolina Vasquez and Gustavo Cantuarias from the Embassy of Chile. Ms Vasquez spoke briefly about the changing image of Chile, which used to be seen as a producer of cheap and cheerful wines, but is now a serious player on the global wine stage with focus on high-quality wine production. The Chardonnay, the first of the Chilean wines of the evening provided ample testimony to the truth of her statement. 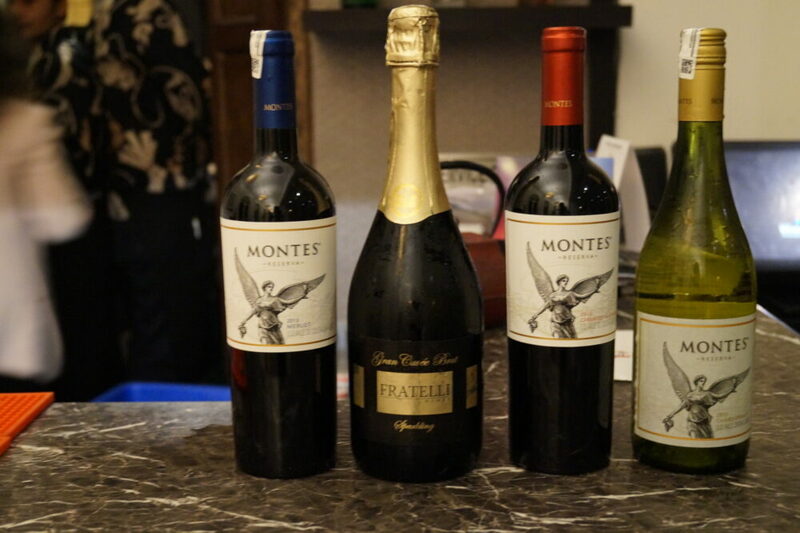 Reva Singh, editor of Sommelier India then gave a brief and illuminating talk on Montes wines, and Chilean wines in general, with an interesting insight into Chile’s highly successful signature grape, Carménère, which was originally from Bordeaux. Miso soup, light and delicious, was followed by the main course of salmon with garlic butter and soya, teriyaki chicken (tofu steak for the vegetarians) and assorted sliced vegetables served with a Montes Cabernet Sauvignon, rich and complex with intense fruity notes. Of course there was rice, both fried and steamed, plus udon noodles. With dessert (agar jelly, cheese and chocolate cake), we tasted the Montes Merlot, the winning wine of the evening for me. 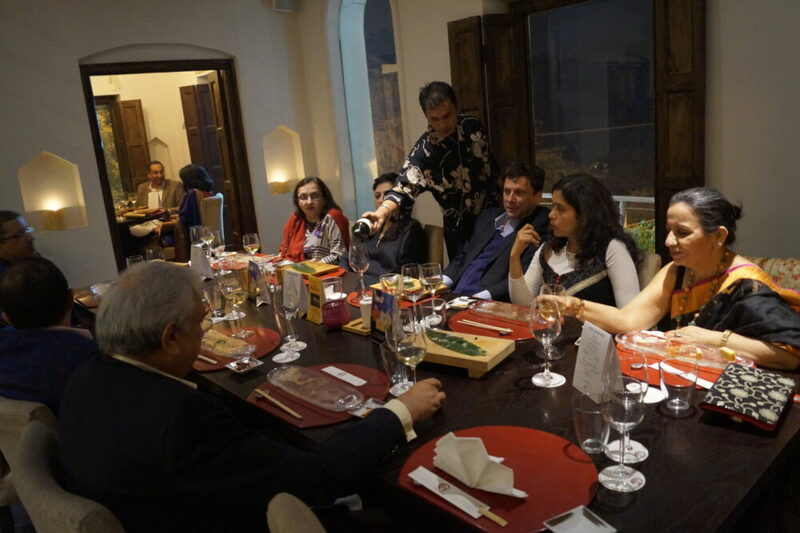 A round of applause for newbie member Puneeta Chadha Khanna, a passionate and knowledgeable foodie who had curated the meal with the chefs of En, brought a memorable evening to a satisfying close. Members of the newly-energised Wine Society are looking forward to many more such events.